On tonight’s second episode, we learned a little bit more about the killer colony that Shelby encountered at the end of the season premiere. We also found out just how our ill-fated couple was able to get that house in North Carolina at such a cheap price. Check out our liveblog/recap below. 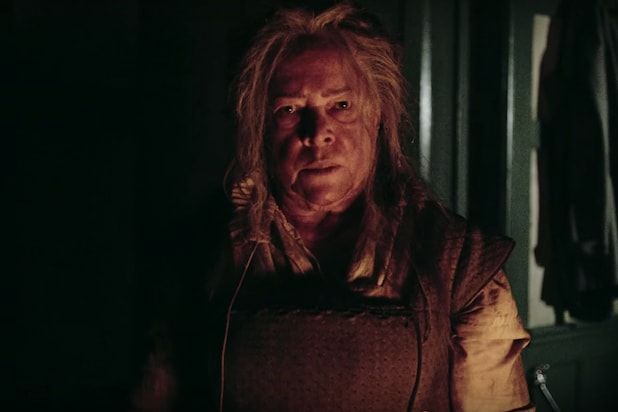 10:06 PM ET: We open up with Kathy Bates performing a macabre sacrifice while showing off her new crazy accent for the season. A guy wearing a pig’s head gets roasted on a spit as punishment for theft, but somehow this isn’t enough to convince Shelby to move out. She tells Matt at the hospital that she thinks its a hoax by the creepy mountain neighbors from the first episode to scare them away. Much like any horror movie victim, Shelby can’t take a hint. 10:14 PM: Time for another tried-and-true horror trope: the kid with the creepy imaginary friend. Lee brings her daughter Flora over for some personal time. Her kid tells her about an imaginary friend named Priscilla who talks about blood and other things that aren’t supposed to be a part of make-believe games. Then Lee hears glass shattering and finds a broken window that’s been smashed by a vase filled with flowers … and a hat that seems to come from colonial times. 10:20 PM: More creepy haunts for Shelby and Matt. In the middle of the night they hear a pig squealing and head outside to investigate. They find a giant version of the “Blair Witch”-style stick figure burning in a forest clearing, with a pig’s head on top and slabs of meat hanging off of it. “This was more than burning a cross on the lawn,” Andre Holland’s Matt says, “there was something demonic about it.” They show it to the cops, who agree to park a squad car out in front. That doesn’t stop Matt from seeing a creepy vision in his house of two sadistic nurses shooting out the brains of an elderly woman who won’t take her meds. 10:25 PM: Matt brings the cop in, and of course the ghosts are gone. The next day, Lee’s ex shows up to pick up Flora, and they find her in a closet. Flora tells them that Priscilla is wearing a funny dress — a 16th century dress perhaps? — and that she’s going to kill them all and save her for last. Lee’s ex takes Flora and leaves in a rage. 10:31 PM: Time for Lee to join in on the creepy hallucinations. After getting drunk following the incident with Flora, she gets tucked into bed by Matt and Shelby. When she wakes up, she sees the nurses Matt saw earlier for a split second, followed by visions of pig tails nailed to the wall and the dancing pig man in the mirror. 10:37 PM: Shelby and Matt see a strange woman outside their window. When they head out to find her, they discover a bunker with a videotape inside. The tape features the man whom Shelby and Lee saw in the tape from the first episode. 10:45 PM: OK, the videotape has a massive exposition dump about the nurses, so here we go. The man on the tape was a professor who came to the house in 1997 to investigate the two nurses, who used the house as an assisted living home and would kill the elderly admitted there. They had two criteria: their clients had to be people their families didn’t want to deal with anymore, and their names had to start with a specific letter. They killed five patients in a specific order, and spray painted the first letter of each of their names on the wall in the house. Matt peels off the wallpaper where he saw the two nurses in his vision and finds the word “MURDE” spray painted in red on the wall. They go back to the tape, and the professor explains that the official story is that the two nurses fled the country after killing the five patients. But he thinks that the women were intending to kill someone with a name beginning with “R” to finish their plans. The only thing is … something more evil stopped them. The tape ends with the professor searching the house for something. He’s attacked by an unknown assailant, and the tape cuts out. Shelby and Matt go to the door and see a bloody cleaver sticking out of it. 10:51 PM: The bank refuses to buy back the house, so Shelby and Matt are stuck with it. Meanwhile, Lee brings Flora back to the house, scared that her ex is going to get a judge to revoke her visitation rights. When Flora gets back to the house, she sees Priscilla beckoning to her outside. When the adults realize she’s gone, they head outside to search for her. The episode ends with them seeing Flora’s jacket hanging from the top of a very high tree. Still no Evan Peters, y’all. NEXT TIME: More freaky visions, more police outside of the house, and in the interviews Lee tells the people talking to her to turn off the cameras. Will the mockumentary format begin to twist?